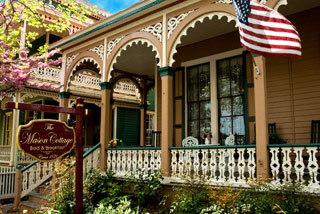 The Candlelight Inn is a beautifully restored Queen Anne, Victorian Bed & Breakfast that concentrates on making its guests feel relaxed. Your innkeepers, Wanda and Michael O'Brien live on premises. 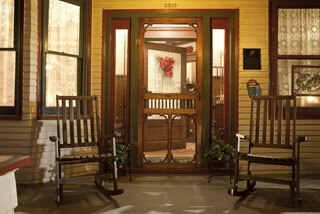 A private home for 80 years, today the Candlelight Inn can be enjoyed by couples seeking a romantic getaway. All guests rooms in the main house have private baths, two with a whirlpool tub, and all have romantic electric fireplaces. Both rooms in the Carriage House have their own gas fireplaces and private, double whirlpool tubs. The Peter Shields Inn is a Select Registry romantic seaside getaway, with nine well-appointed guest rooms, breathtaking ocean front views and gourmet dining. 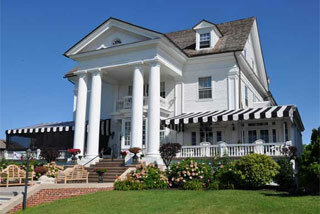 This 1907 Georgian Revival mansion, a Bed and Breakfast Diamond Collection boutique inn, is located on Cape May’s Beach Avenue, steps from the beach. Sit on our front porch, watch dolphins and migrating birds navigate the Atlantic coastline. Take the Inn’s bikes and leisurely explore all that Cape May has to offer. Complete your day in our Zagat recommended fine dining restaurant a place where epicurean delights and impeccable service are always on the menu.